You can imagine Rubeus Hagrid and Newt Scamander (Eddie Redmayne) being best friends had they been born in the same era, such is their infectious affection for the weird and wonderful creatures to be found in the magical realm. In her debut screenplay, JK Rowling extends her enchanting universe with a spin-off set in 1920s New York, inspired by a textbook mentioned in Harry Potter and the Philosopher's Stone (later turned into a book). 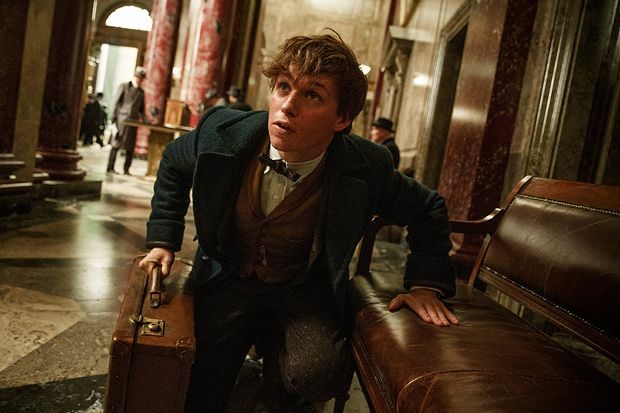 The impeccable costume design from Colleen Atwood and inventive world-building make it easy to get swept up in Scamander's adventure, as this animal whisperer of sorts (who finds it hard to make eye contact with his own kind) is tasked with gathering up the fantastic beasts who have escaped from his briefcase. Despite the fact that a multitude of characters are introduced, director David Yates (who helmed four of the Potter films) manages to maintain a thrilling pace, delivering exciting spectacle that includes a safari park of curiosities. The film hits the ground running with the dawning of dark times, told via an opening credits sequence of newspaper clippings which reveal that beasts are banned and there is an increasing anti-witch sentiment amongst the US population, with a mysterious presence running amok across the city. Scamander drags kindly baker and muggle Jacob Kowalski (an endearing Dan Fogler) on his escapades. They are joined by a pair of rosy-cheeked sisters with stylish bob cuts, Porpentina and Queenie Goldstein (Katherine Waterston and Alison Sudol), both of whom turn out to be incredibly nifty with a wand. Samantha Morton as puritanical fear-monger Mary Lou, who physically harms the children in her care, is truly terrifying; and Ezra Miller – playing Credence, who bears the brunt of Mary Lou's punishments – puts in a moving performance, as Yates whips up a sense of formidable unease with their narrative. In a similar manner to Ghostbusters II, negative energy and fear take the form of something very dangerous, which in turn creates mass panic and destruction. Rowling's screenplay skilfully balances the dark and light; the cheerful frolics, friendship and romance serve as a reminder to the characters of just what they are fighting for. General release from Fri 18 Nov.